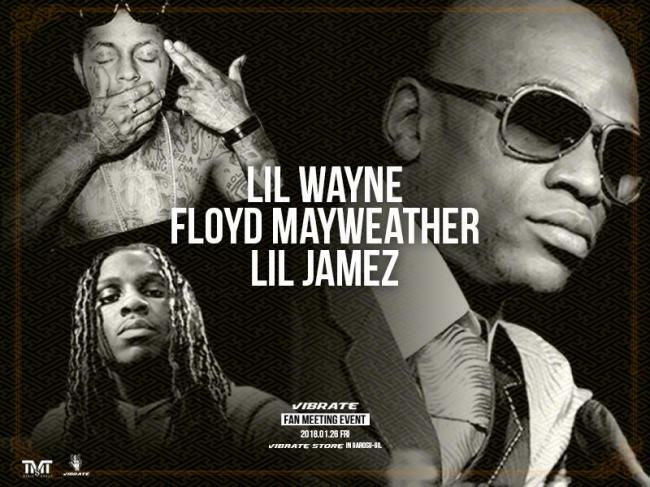 Boxing and hip-hop stars Floyd Mayweather Jr., Lil Wayne and Lil Jamez have canceled their highly anticipated visit to Korea. On Saturday, TMT Music Group said in an official press release that the “2018 Seoulfull: TMT Music Group” concert -- originally slated for Jan. 27 in Seoul -- has been canceled due to unspecified problems concerning Mayweather‘s visa to Korea. It vowed to reschedule the concert and notify fans as soon as possible. Mayweather, who ESPN named in 2016 as the “greatest pound-for-pound” boxer of the past 25 years, is undefeated in his professional boxing career at 50-0 with 27 knockouts. He is one of the wealthiest and most controversial athletes of all time. He ended his career last year with a KO against MMA star Conor McGregor. He was to visit Korea for promotion of his recently launched label TMT Music Group.